For my submission I thought hard about what shoe has the strongest memory tied to it. What story to tell. What would reflect well, or unique, or "hip" (is that what the kids say these days?). There was a few that I was originally going to submit and give you an option to choose, but none of them seemed quite strong enough. Or original. One option I thought of was my bare feet. I've honestly never loved shoes. I've always taken the chance not to wear them. It's mostly provided me with comfort. Or a stupid sense of teenage rebellion (a la purposefully not wearing shoes when walking into a Hy-Vee grocery store, or a Granite City Sunday buffet. Just to prove that I could get away with it). Sometimes it ended up hurting me. Like when I stepped on a push pin in the back yard when I was young. Mother had to pull it out of my foot and wash the wound with Neosporin in the sink. But I've never once regretted going barefoot. It is my base state. It is when I feel the most comfortable. Although someone has already used that as their memorable "shoe" I saw. So it would not serve as a unique submission. 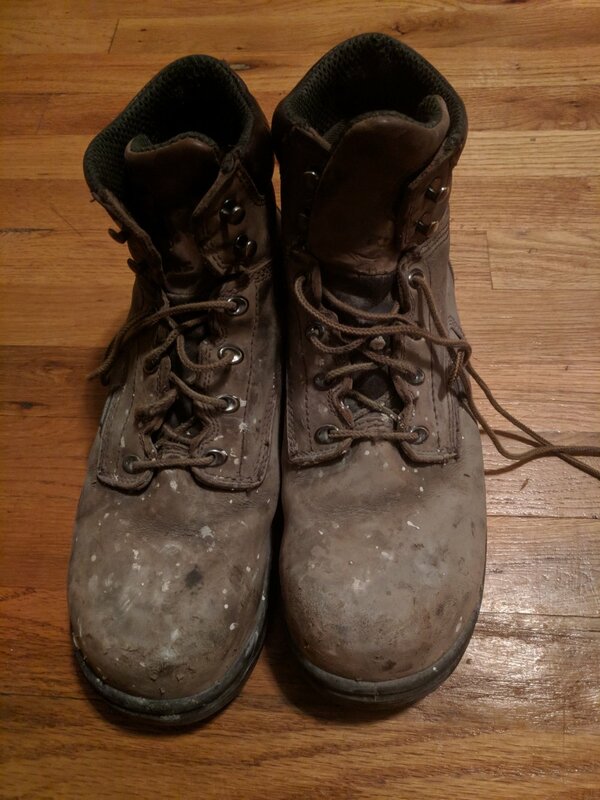 My third option, until happening upon my last, final and actual submission was a story of my work boots. They were provided by the company as necessary PPE for the job. Without them I would not be able to enter the plant and do the work I need to day in and day out. They keep my feet safe from any harm imaginable in a dangerous manufacturing environment. But alas...this story is not very interesting for I have no passionate tie or link with these shoes. They are simply just mandatory for my safety at work. So we get to the actual submission. Finally. And it is that I truly don't have a strong, unique or interesting story for any particular pair of shoe. It is that my shoes are what they are. They serve their purpose. They are a piece of fabric, that I at one point thought were interesting or necessary enough to cover my feet. And they have all done this and more. They've all served their purpose and then some. See, I wear my shoes into the ground. I use them until their useless, and then continue to use them until the next pair happens upon me. It is not a choice to get a new pair of shoes. It just sort of happens. Whether a new pair of shoes be a gift. Or a mandatory purchase for work. Or a random productive desire to run again. And until that point my current pair of shoes, no matter their condition are the shoes that will cover my feet. As you can see in the photos every single pair of shoes is damaged beyond repair. There are holes in the heels. There are tears in the fabric. They are torn apart, duct taped, chipped away, ripping at the seems. They are worn until another pair happens to come into my possession and relieve the old pair from their faithful duty. Typing that out sounds kinda cheesy....but I'm sticking with it. Every pair of shoes I've owned have been the only pair of shoes I wear. Summer or Winter, rain or shine, no matter their purpose or how they look or what condition they are in. I've always stuck to one pair of shoes. For every occasion, for every type of weather, until they wear out and another pair comes into my possession by happenstance. I then switch to wearing that pair of shoes and only that pair of shoes. I am solely dedicated to one pair until the next. My shoes last me a long time. And they have all been the best pair of shoes I could ask for. Each represent a different time in my life where that particular style or look or convenience was what I was interested in and happened upon at the time. And each pair has spanned years and years after originally attaining them. And that is why I don't have a single memory or passion for a pair of shoes. Because I don't choose the pair of shoes that I wear for years to come. The shoes choose me. The shoes pictured have come into my possession in order as follows. Sambas, 2008: I needed them for indoor soccer. They were purchased for $30 at Kohls. After indoor soccer they were used as my everyday shoe. It was also at this time I was longboarding with friends. Hence why the heels are so worn out. Sperry's, 2011: Purchased by my Mother at a Sperry's store downtown Kansas City while visiting my sister Kelsy. She was insistent that I get a new pair of shoes since my Sambas had holes in the heels. She had very fond memories of her own as a young adult. And spoke volumes about the durability of a pair of Sperry Boat Shoes. Asics, Summer of 2014: Purchased as a gift from my Mother after I told her I wanted to get into running again. It was a "last time" treat sort of thing since I was about to move to Chicago for my new job out of college. One last time a Mother could treat her son to something he really didn't have the money to afford at the time. They hurt when I tried running in them, but felt great for every day use. These became my new everyday shoe. 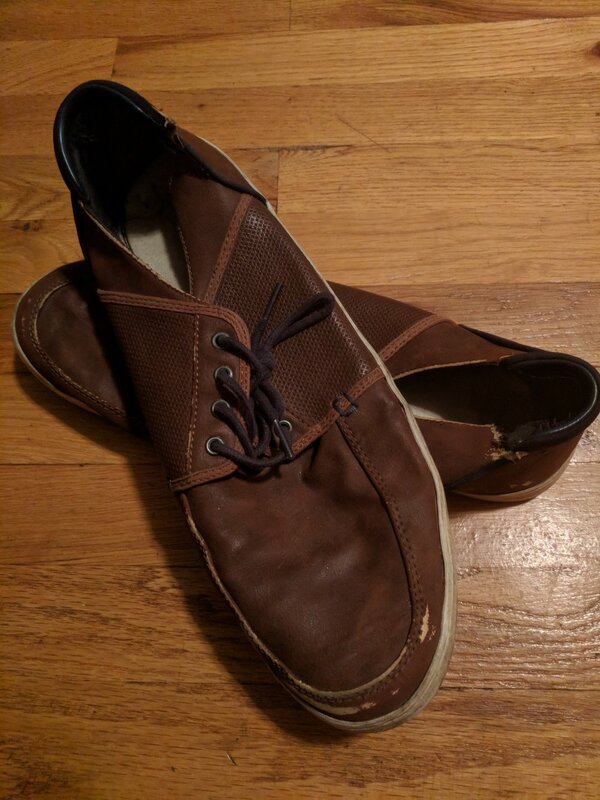 Target Leather Shoes, Summer of 2017: These were from my fiance Melissa. She wanted me to wear something other than the Asics (what she and I called "dad" shoes) so she bought me the shoes as a gift from Target. She was not so keen on my lack of caring for any sort of fashion sense and using my Asics as every day shoes. I really loved the look of the shoes, so I wore them every day. Missing the convenience of not wearing any socks (something I could do with my Sperry's during summers) I started wearing THESE shoes without socks. These shoes not being the most expensive, but still very nice looking. They unfortunately fell apart sometime around winter of 2017, and after the first hint of snow seeping into the heel through the rip in the seam, they had to be retired and I was thrown back into the dad shoe asics. Asics Epic Comeback! 2018 and beyond: My Asics have still been my go to shoe every day. Recently in the Rocky Mountains the hole in the mesh had grown to where my toes started to involuntarily poke out of the shoe itself. This was not great as I was just about to use them as a supportive shoe for our 4 day backpacking trip. I took some purple duct tape wrapped around one of my water bottles for emergency in the backcountry and made a quick repair. They are as good as new! As you can see from photos. I ended up buying new running shoes with a custom insert! These shoes were purchased at a running shoe store that tailor fitted me with the correct shoe for my pace, use, and running style. They are the shoes I ended up using in the backcountry of the Rockies as I was afraid of how little support my old Asics would give me while I was hiking 5-12 miles a day with 30 pounds on my back. I was reluctant to use them as they are brand new and there were stories of snow on the summits of the mountains and thunderstorms on a daily basis that might get my new pair of shoes muddy and beaten already. But I broke down and used them anyways. Luckily they didnt get to dirty, I plan on cleaning them up soon so they look good as new! But they did already get a few chips from the many rocks and branches lying on the trail. Alas....my new shoes are "broken in" and showing their own signs of wear. 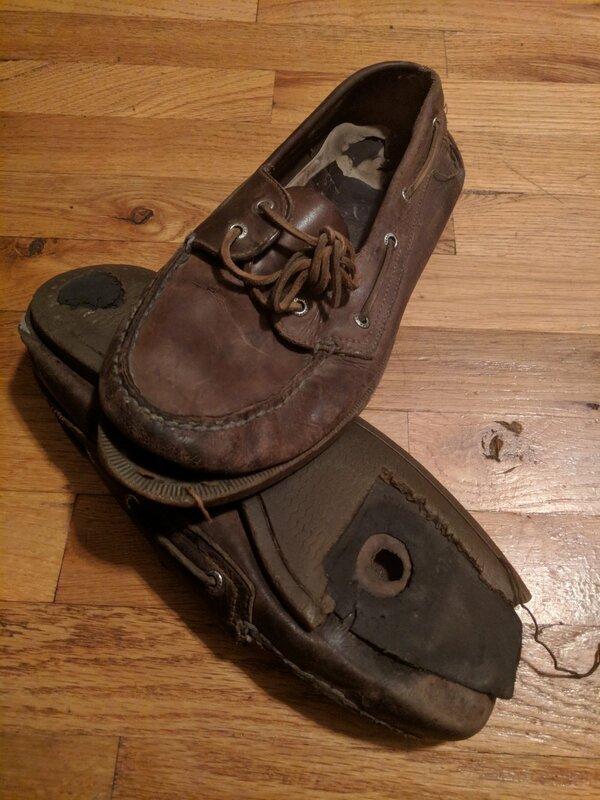 Eventually, after I've ran many a miles in them, and their support has been long gone and they are no longer useful as a pair of running shoes. They will become my everyday shoe. Full of their own adventures either near to a restaurant around the corner, or far. Such as the 12,000 foot mountain they have already walked all over just 3 days ago.